Asbestos describes any member of a group of minerals that can be fibrous, many of which are hydrous magnesium silicates. It is mined from metamorphic rocks and occurs in many forms. It is highly resistant to heat and fire—properties that have long been exploited for a variety of purposes. It was used in fabrics such as Egyptian burial cloths and Charlemagne's tablecloth. Given its heat resistance, asbestos is used in brake shoes and gaskets. In the past, it was used to insulate the wiring of electric ovens and hotplates, and to insulate buildings and protect them from fire. Inhalation of some types of asbestos fibers, however, can cause a number of serious illnesses, including cancer. In light of such hazards, many countries have banned the use of asbestos for various applications. The name asbestos is based on its historical use in lamp wicks. It is a misapplication of the Latin word for "quicklime," in turn derived from the Greek word ἄσβεστος: a, meaning "not," and sbestos, meaning "extinguishable." As mentioned above, asbestos is noted for its resistance to heat and fire. It is an insulator against heat and electricity. It is also noted for its tensile strength, flexibility, and resistance to chemicals. Chrysotile, CAS No. 12001-29-5, is obtained from serpentine rocks. Chrysotile is the type most often used industrially. 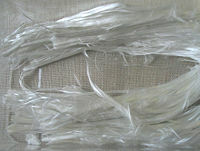 It is more flexible than other types of asbestos; it can be spun and woven into fabric. This is the kind of asbestos of which theater curtains are made, as well as firefighters' suits, and possibly Charlemagne's tablecloth. There is evidence that this type of asbestos is harmful, although, in the pure form, not perhaps as harmful as other forms (according to a UK Health & Safety Commission report, Asbestos: Effects on Health of Exposure to Asbestos, 1985). However, in reality, commercially used Chrysotile is usually contaminated with a powerfully hazardous form, namely Tremolite. One formula given for Chrysotile is Mg3(Si2O5)(OH)4. Amosite, CAS No. 12172-73-5, is a trade name for the amphiboles belonging to the Cummingtonite—Grunerite solid solution series, commonly from Africa, named as an acronym from Asbestos Mines of South Africa. One formula given for Amosite is Fe7Si8O22(OH)2. This type of asbestos is extremely hazardous. Riebeckite, CAS No. 12001-28-4, also known under the variety name of Crocidolite, is an amphibole from Africa and Australia. It is the fibrous form of the amphibole riebeckite. Blue asbestos is commonly thought of as the most dangerous type of asbestos. One formula given for Crocidolite is Na2Fe2+3Fe3+2Si8O22(OH)2. This type of asbestos is also very hazardous. Notes: Chrysotile commonly occurs as soft friable fibers. Asbestiform amphibole may also occur as soft friable fibers, but some varieties such as amosite are commonly straighter. All forms of asbestos are fibrillar, in that they are composed of bundles of long fibers, each of which has a width of less than 1 micrometer. Amphiboles most commonly occur in nature in a safer, nonfibrous form. 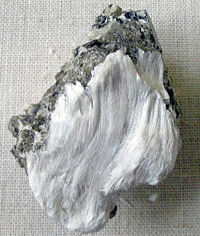 Asbestos with particularly fine fibers is also referred to as "amianthus." Other regulated asbestos minerals, such as tremolite asbestos (CAS No. 77536-68-6) Ca2Mg5Si8O22(OH)2; actinolite asbestos (or smaragdite) (CAS No. 77536-66-4) Ca2(Mg, Fe)5Si8O22(OH)2; and anthophyllite asbestos (CAS No. 77536-67-5) (Mg, Fe)7Si8O22(OH)2; are less commonly used industrially, but can still be found in a variety of construction materials and insulation materials and have been reported in the past to occur in a few consumer products. Other natural and not currently regulated asbestos minerals, such as richterite, Na(CaNa)(Mg,Fe++)5[Si8O22](OH)2, and winchite, (CaNa)Mg4(Al,Fe3+)Si8O22(OH)2, may be found as a contaminate in products such as the vermiculite containing Zonolite insulation manufactured by W.R. Grace and Company. These forms of asbestos are no less harmful than chrysotile, amosite, or crocidolite. In 1989, the United States Environmental Protection Agency (EPA) passed the Asbestos Ban and Phase Out Rule, which was subsequently overturned in the case of Corrosion Proof Fittings v. U.S. Environmental Protection Agency, 1991. This ruling leaves many consumer products that can still legally contain trace amounts of asbestos. The severity of cancer triggered by asbestos depends on the type of asbestos. It also depends on the amount inhaled. It is a common welding occupational hazard. Items made of asbestos were held in so great an esteem that they held an equal value to gold; none but emperors and kings had napkins made of it. It is said that Charlemagne had a tablecloth made of asbestos. According to legend, he cleaned it by simply throwing it into a fire. Others assert that the ancients used asbestos to make perpetual wicks for sepulchral lamps. In more recent centuries, asbestos was indeed used for this purpose. Although asbestos causes skin to itch upon contact, ancient literature indicates that it was prescribed for diseases of the skin, and particularly for the itch. It is possible that they used the term asbestos for alumen plumosum, because the two terms have often been confused throughout history. Asbestos fibers were once used in automobile brake pads and shoes. Since the mid-1990s, a majority of brake pads, new or replacement, have been manufactured with Aramid fiber (Twaron or Kevlar) linings (the same material used in bulletproof vests). Kent, the first filtered cigarette on the market, used crocidolite asbestos in its "Micronite" filter from 1952 to 1956. 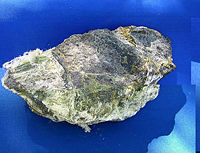 Chrysotile is the form of asbestos from the serpentine group that has been used commercially. Most breathable asbestos fibers are invisible to the unaided human eye because their size is about 3.0-20.0 µm in length and can be as thin as 0.01 µm. Human hair ranges in size from 17 to 181 µm in width. Fibers ultimately form because when these minerals originally cooled and crystallized, they formed by the polymeric molecules lining up parallel with each other and forming oriented crystal lattices. These crystals therefore have three cleavage planes, just as other minerals and gemstones have. But in their case, there are two cleavage planes that are much weaker than the third direction. When sufficient force is applied, they tend to break along their weakest directions, resulting in a linear fragmentation pattern and hence a fibrous form. This fracture process can keep occurring and one larger asbestos fiber can ultimately become the source of hundreds of much thinner and smaller fibers. As asbestos fibers get smaller and lighter, they more easily become airborne and human respiratory exposures can result. Fibers will eventually settle, but may be re-suspended by air currents or other movement. Friability of an asbestos containing product means that it is so soft and weak in structure that it can be broken with simple, finger crushing pressure. Friable materials are of the most pressing concern due to their easily damaged nature. The forces or conditions of usage that come into intimate contact with most non-friable asbestos containing materials are substantially higher than finger pressure. Non-friable asbestos products can release substantial quantities of asbestos fibers into their environments as well. Low levels of asbestos are in the air people breathe and some of the water people drink, including water from natural sources. Studies have shown that members of the general (non-occupationally exposed) population have tens of thousands to hundreds of thousands of asbestos fibers in each gram of dry lung tissue, which translates into millions of fibers and tens of thousands of asbestos bodies in every person's lungs. There is no "safe" level of asbestos exposure for any type of asbestos fiber. EWG Action Fund estimates that in the United States, about 10,000 people die each year of asbestos-related diseases, such as mesothelioma, asbestosis, lung cancer, and gastrointestinal cancer. Asbestos warts—caused when the sharp fibers lodge in the skin and are overgrown causing benign callus-like growths. Pleural plaques—discrete fibrous or partially calcified thickened area which can be seen on X-rays of individuals exposed to asbestos. They do not become malignant or cause other lung impairment. Diffuse pleural thickening—similar to above and can sometimes be associated with asbestosis. Usually no symptoms shown, but if extensive can cause lung impairment. Asbestos litigation is the longest, most expensive mass tort in U.S. history, involving more than 6,000 defendants and 600,000 claimants. Current trends indicate that the rate at which people are diagnosed with the disease will likely increase through the next decade. Analysts have estimated that the total costs of asbestos litigation in the United States alone is over $250 billion. Due to the prevalence of asbestos, it is normally part of the scope of a Phase I Environmental Site Assessment to inspect for potential asbestos in a building which is being sold. The volume of the asbestos liability has alarmed the manufacturers and insurance industry. The amounts and method of allocating compensation have been the source of many court cases, and government attempts at resolution of existing and future cases. Many buildings contain asbestos, which was used in spray-applied flame retardant, thermal system insulation, and in a variety of other materials. Asbestos was sometimes "flocked" above false ceilings, inside technical ducts, and in many other small spaces where firefighters would have difficulty gaining access. Structural components like asbestos panels were also used. In residences, asbestos was often a component of a type of flocked acoustic ceiling called "popcorn ceiling," until its production was banned in the U.S. in 1978. However, the ban allowed installers to use up remaining stocks, so houses built as late as 1986 could still have asbestos in their acoustic ceilings. The only way to be sure is to remove a sample and have it tested by a competent laboratory. Even if the workers are protected, such maintenance operations may release fibers into the air, which may be inhaled by others. Interventions in areas where asbestos is present often have to follow stringent procedures. If removal is to be performed when users are still present in the building, it is usually necessary to relocate some users temporarily. Typically, the part of the building from which asbestos is being removed has to be sealed off in order to prevent contamination of the other areas. If the building is closed to normal users, it may be necessary to seal it off from the outside atmosphere so that no accessible air is contaminated. Examples of asbestos removal enterprises include the Jussieu Campus (begun circa 1996) and the Tour Montparnasse (in 2005, projected duration was 3 years if the tower was emptied of its users, and 10 years if it was not). An asbestos-containing building that is to be torn down may have to be sealed, and to have its asbestos safely removed before ordinary demolition can be performed. The asbestos removal may take longer and cost more than the actual demolition. For example, the former seat of parliament of East Germany, the Palast der Republik was stripped of most of its asbestos between 1998 and 2001, before it was finally demolished starting in 2006. The demolition process alone was expected to cost between 20 and 60 million Euros. Recently, a new method was developed to remove asbestos from fireproof materials, without reducing the material's fire-resistance. A foam developed by the Brookhaven National Lab and W.R. Grace & Co, which has won an R&D award, is able to chemically remove asbestos from fireproof while preserving its fireproof abilities. This removes the need to replace asbestos-containing materials. Asbestos regulation critics include Junkscience.com author and Fox News columnist Steve Milloy and the asbestos industry. They sometimes argue that the ban does more harm than good and that replacements to asbestos are inferior. An example is the suggestion that the space shuttle Challenger exploded because the maker of O-ring putty was pressured by the EPA into ceasing production of asbestos-laden putty. However, scientists point out that the putty used in Challenger's final flight did contain asbestos, and failures in the putty were not responsible for the failure of the O-ring that led to loss of the shuttle. Scott Bass suggests that the World Trade Center towers could still be standing, or at least would have stood for longer, had a 1971 ban not stopped the completion of the asbestos coating above the 64th floor. However, this was not mentioned in the National Institute of Standards and Technology's report on the Towers' collapse. Thus, these pro-asbestos opinions generally appear on the fringes of accepted science. Many companies that produced asbestos-cement products that were reinforced with asbestos fibers have developed products incorporating organic fibers. One such product was known as Eternit, and another Everite, now use Nutec fibers which consist of organic fibers, portland cement, and silica. ↑ Corrosion Proof Fittings v. Environmental Protection Agency Retrieved September 20, 2018. ↑ Occupational Safety & Health Administration, Asbestos Retrieved September 20, 2018. ↑ Environmental Working Group, The Asbestos Epidemic in America Retrieved September 20, 2018. ↑ RAND Institute for Civil Justice, Asbestos Litigation. Retrieved September 20, 2018. ↑ Brookhaven National Laboratory, Brookhaven Lab and W.R. Grace Win R&D 100 Award for Asbestos-Digesting Foam. Retrieved September 20, 2018. ↑ Multinational Monitor, Corporate Junk Science. Retrieved September 20, 2018. ↑ James Oberg, 7 Myths about the Challenger Shuttle Disaster NBC News, January 25, 2011. Retrieved September 20, 2018. ↑ Steven Milloy, Asbestos Could Have Saved WTC Lives Fox News, September 14, 2001. Retrieved September 20, 2018. U.S. EPA Asbestos Home Page. British Government Health and Safety Executive (HSE). 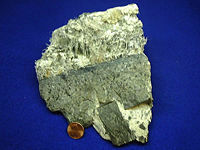 Parachrysotile (asbestos) at the webmineral.com Mineral Database. White Gold Pioneers: Asbestos Mining — The origins of asbestos mining, illustrated with many early photographs. Asbestos Agency for Toxic Substances and Disease Registry. Asbestos Diseases Society of Australia. Factsheet 51 - Asbestos in construction European Agency for Safety and Health at Work. Asbestos Overview & Health Concerns The Asbestor Institute. Asbestos and Cancer Mesothelioma Guide. Asbestos and Its Dangers – What is Asbestos? Mesothelioma.net. This page was last modified on 25 September 2018, at 21:24.